Clear skies and a prominent day-11 moon on the evening of 16th December had me out really enjoying sketching; it wasn’t too cold (to begin with), the skies were clear, the target was high and I had plenty of time…..all a rare occurrence. 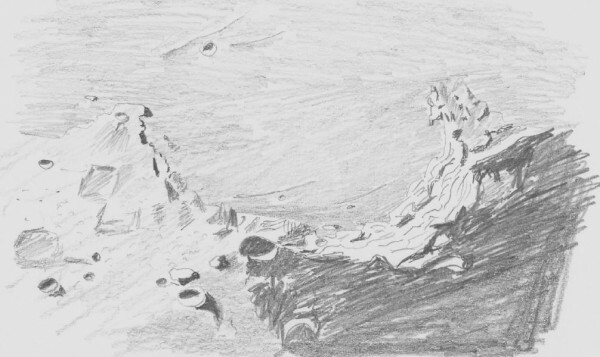 I sketched one of the most architecturally pleasing parts of the moon; the Sinus Iridum, which is a large crater/small basin with a partially flooded rim. Of the two promontories, the one on the right (Promontorium Heraclides) is also known as the moon maiden, because at certain times it resembles the profile of a lady, with her long hair falling away off her shoulders. Also visible are the wrinkle ridges which might be traces of the buried rim, and craters Bianchini, Maupertuis, La Condamine and Bouguer. 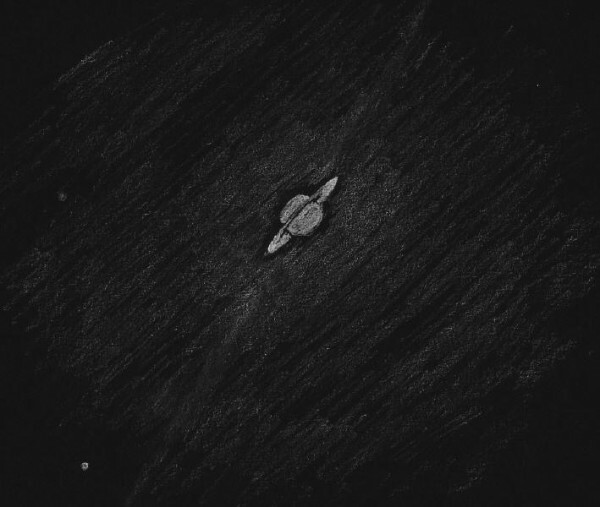 Awaking on 17th at 4am with busy thoughts, I decided that viewing Saturn would be better than attempting to get back to sleep. And so it was. I was surprised by quite a lot. The rings had opened up quite a bit since I saw them last spring. Not being close to opposition, the planet was quite small and I couldn’t see much detail on the planet itself. Only one moon was obvious; Titan predictably. With effort, another moon could be viewed roughly forming a right-angled triangle between Titan and the planet; it’s the faint spot at middle-left of the picture. This turned out to be Iapetus, which was pleasing because I haven’t seen that very often. It was new for me to see a moon so out of plane with the planet and the rings as last year they were mostly in line. It was good to see such old friends again. * Object Name – Sinus Iridium, Mare Imbrium; Saturn, Titan, Iapetus. * Object Type – Lunar Crater, Mare; Planet, Moons. * Media – Graphite pencil on white paper. Observing instrument: Skywatcher Skyliner 152mm f8 Dobsonian, 10mm e.p., x2 Barlow. Beautiful sketches of Sinus Iridium and Saturn with moons.